1 First – What Exactly Is A Polytunnel? Everyone and their grandmother seems to be building polytunnels these days – and for a good reason. They’re an absolutely amazing gardening tool that extend the growing season, protect your garden from the elements, and ultimately increase the size of your harvest. And for all of these benefits, you don’t even have to build a permanent structure like a greenhouse! About 9/10 people who buy premade polytunnels end up erecting them themselves. It’s very simple to do and saves a lot of money compared to hiring a gardening expert or builder to do the job. First – What Exactly Is A Polytunnel? A polytunnel is best thought of as a frame for your garden. It’s usually made from a semi-circular metal frame that spans the length of your garden. This frame is typically covered with polythene plastic that’s UV resistant so it lasts quite a while. You might be thinking that this would block some valuable sunlight from your crops, but you’d be wrong. Over 90% of natural sunlight penetrates the polythene, meaning your plants will get all of the sun that they need. In fact, the semi-opaque quality of the plastic actually diffuses the light, meaning you won’t have to worry about plants shading each other as much. ​Inside your polytunnel, air will be kept warmer than outside and will not fluctuate in temperature as rapidly as it might outside of the tunnel. This means you can adjust the temperature inside your polytunnel and be confident that it will remain stable for quite a while. In winter, you can keep it even warmer inside by lining the tunnel in bubble wrap to provide further insulation. When building anything, you always have to start by laying the foundation. Without it, you’re building on unstable ground, which is a recipe for disaster. When building polytunnels, placing your foundation tubes correctly is vital to both the longevity and stability of your tunnel. Your first step is to mark the base positions around your garden, making sure that you space them evenly apart. All of the angles should be square to one another. Next, drive your foundation tubes into the ground at the positions you marked. Make sure to use a block of wood in between foundation tubes and your hammer so you don’t damabe the tubing. You can use tubes from your pre-fabricated polytunnel, but if you’re building from scratch, then using scaffolding poles or water pipe mains are a great substitute. Cut them to about 6 feet long and drive them into the ground about three feet deep. Adjust this depth based on how large your want your polytunnel to be. You can either use tubes provided in a pre-fabricated polytunnel, or if building your own tunnel from scratch offcuts of scaffolding poles or mains water pipe provide the perfect inexpensive substitute – these should be cut to about six feet in length, and driven into the ground to a depth of about three feet (depending on your desired polytunnel size). Once they’re securely in the ground, check the tubes are level with a spirit level. No matter if you’re using a pre-fabricated polytunnel or making one from scratch, you’re going to need aluminum noops to build the rest of your frame. Choose your hoop size wisely – this will determine the overall size of your polytunnel. Connect the hoops together once you have the basic framework laid out. Slide them over the foundation tubes and bolt them in place. Lastly, fit your ridge pole, doorframes, and corner bracing. Make sure your hoops are straight and in line, then tighten everything together. You’ve laid your foundation and built the framework on top of it – now it’s time to attach your cover! This is where your structure goes from ‘tunnel’ to ‘polytunnel’. If you’ve purchased a pre-fabricated polytunnel, you will usually have some kind of cushioning to put over your aluminum hoops to protect your polythene sheet from tearing or ripping. If you’re building from scratch, use foam or tape to make sure that the hoops are free from anything that might tear your polythene sheet. You don’t HAVE to do this, but it will typically increase the lifespan of your sheet by about a year, which can save you a serious chunk of change. Unroll your sheet on the ground and slide it over your hoops so it fits perfectly evenly across the entire frame. Most people just attach their sheet to the base rail to secure it, or you can just bury it in a trench about half a foot deep. If you don’t have a base rail and also don’t have space to bury the sheeting into the ground, you can make your own base rail by using timber and bolting it to your foundation tubes. Whatever you decide, it’s important to keep the sheet as tight as you can when you fit it. 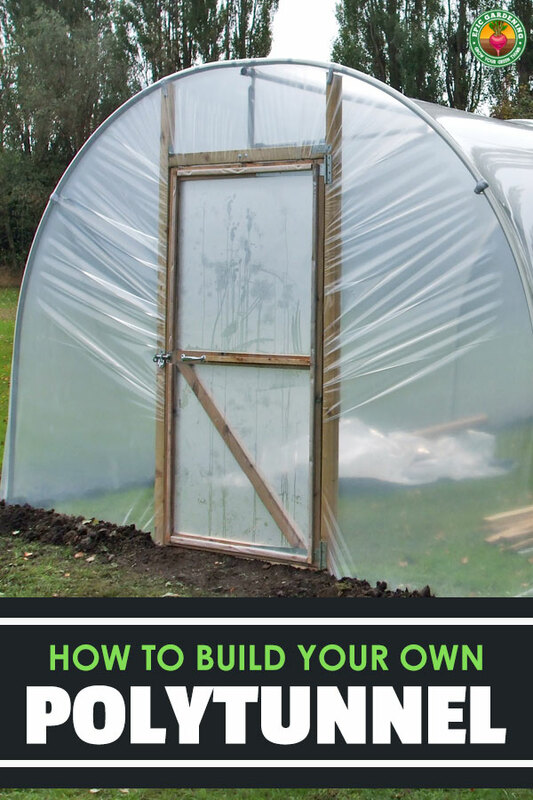 The last step is to cut a V shape in your sheet where you’d like to enter the polytunnel – or just use a door system that’s provided with your prefab kit.